-ake Word Family Brochure - Word Work! Easy to Fold! Easy to Use! Word Family Brochure Bundle - 20 Brochures Included! Easy to Fold! Easy to Use! This product is a super cute brochure all about the word family -ake. This product will make a great literacy center activity, homework activity or can be used as a weekly spelling list. 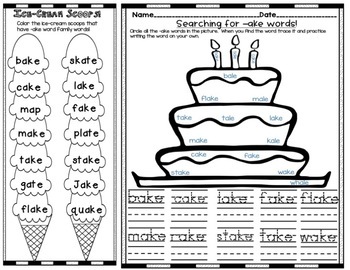 The brochure contains -ake word searches, -ake word list, -ake word printing, and coloring activities. -ock Word Family Brochure - Word Work! Easy to Fold! Easy to Use! -ap Word Family Brochure - Word Work! Easy to Fold! Easy to Use! -ale Word Family Brochure - Word Work! Easy to Fold! Easy to Use! -at Word Family Brochure - Word Work! Easy to Fold! Easy to Use! -est Word Family Brochure - Word Work! Easy to Fold! Easy to Use! -aw Word Family Brochure- Word Work! Easy to Fold! Easy to Use! -ick Word Family Brochure - Word Work! - Easy to Fold! Easy to Use! -ay Word Family Brochure - Word Work! Easy to Fold! Easy to Use! 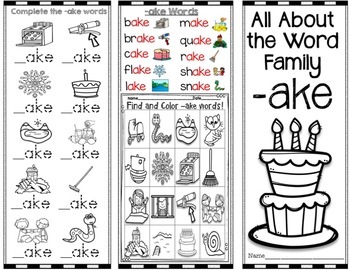 -ash Word Family Brochure - Word Work! Easy to Fold! Easy to Use! -ight Word Family Brochure - Word Work! Easy to Fold! Easy to Use! -ack Word Family Brochure - Word Work! Easy to Fold! Easy to Use! 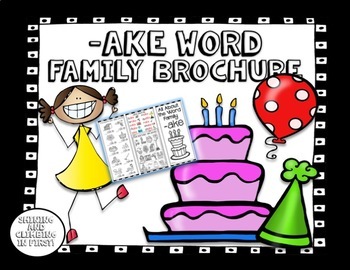 -ame Word Family Brochure - Word Work! Easy to Fold! Easy to Use!